Not to be confused with the present-day Senate of France. The Sénat conservateur ("Conservative Senate") was an advisory body established in France during the Consulate following the French Revolution. It was established in 1799 under the Constitution of the Year VIII following the Napoleon Bonaparte-led Coup of 18 Brumaire. It lasted until 1814 when Napoleon Bonaparte was overthrown and the Bourbon monarchy was restored. The Sénat was a key element in Napoleon's regime. With the Tribunat and the Corps législatif, the Senate formed one of the three legislative assemblies of the Consulate. 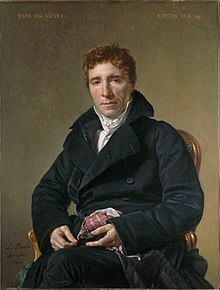 The constitutions of Year X (1802) and Year XII (18 May 1804; instituting the First French Empire under Napoleon) reinforced the importance of the Sénat conservateur. Relation between different offices and assemblies under the Constitution of the Year VIII. Set up under the direct influence of the regime's new master, First Consul Napoleon Bonaparte, the Constitution of 22 frimaire year VIII (13 December 1799) was the first to recreate a senate. Napoleon was to make this "Sénat conservateur", charged with watching over the survival of the Constitution, a key element in his regime. This first senate had to be made up of only 60 inamovible (immoveable, i.e. permanent) members, aged at least 40, to which had to be added two supplementary members every year for ten years, ending up with 20 supplementary members. There was no longer any question of elections (even indirect ones) to form this assembly. The Constitution provided for Sieyès and Roger Ducos, the outgoing second and third consuls, to become ex officio members of the Senate. In consultation with Cambacérès and Lebrun (the new second and third consuls directly designated by the Constitution), it also granted the outgoing consuls the privilege of choosing the majority of the Senate (i.e. 29 other senators). This majority then picked the rest of the members. The Senate thus recruited itself and subsequently replaced deceased members by choosing from among three candidates presented to it by the First Consul, the Tribunat and the Corps législatif. The Napoleonic senate set itself up at the Luxembourg Palace, based in a semicircle of seats added to the central part of the building by the Palace's architect Chalgrin – in the words of the Constitution, "The sittings [of the Senate] are not [to be] public". The first Sénat conservateur included former members of the revolutionary assemblies (François de Neufchâteau, Garat, Lanjuinais), as well as scholars (Monge, Lagrange, Lacépède, Berthollet), philosophers (Cabanis), and even the explorer Bougainville and the painter Vien, member of the Institut. In year X (1802), a revision of the Constitution reinforced senators' positions. From then on the Senate would rule via acts having the force of law, known as "sénatus-consultes", in all matters unforeseen by the Constitution and which needed political action from the regime. The procedure was used, for example, for the 1802 amnesty for émigrés. The number of senators rose to 120. First Consul Bonaparte directly controlled the Senate's activity and composition – he convened it, presided over it, reserved the right to present it with its candidates, personally designated three candidates from the list of citizens elected by the electoral colleges and could also name senators of his own initiative. Sénatus-consulte du 14 Thermidor An X (2 août 1802), proclaiming Napoleon "First Consul for life"
Sénatus-consulte organique du 26 Vendémiaire An XI (18 October 1802), relating to foreigners becoming naturalised French citizens, for services rendered to the Republic, importing of useful inventions or the foundation of major establishments. Sénatus-consulte du 8 Ventôse an XII (28 February 1804), suspending jury functions for treason trials for years XII and XIII. In January 1803 Napoleon created the system of sénatoreries, which ensured the senators' complete compliance and docility. From June 1804 onwards, these were granted to 36 senators and made these senators regional "super-préfets". They gave these senators the right, during their own lifetime, to have a residential palace (a château or a former episcopal palace) and to annual revenue from 20,000 to 25,000 francs – doubling ordinary senatorial pay. For example, Berthollet received the sénatorerie of Montpellier, occupied the bishop's palace at Narbonne and received an annual revenue of 22,690 francs. The Constitution of the Year XII (1804) proclaimed the First French Empire and increased the Senate's dependency on Napoleon (now emperor). Napoleon's rewards to his senators became more and more frequent, as did the senators' shows of allegiance to him. On 1 January 1806, in homage to these "sages de l’Empire" (wise-men of the Empire), the emperor granted the senators 54 enemy flags. The "sénateur maréchal d’Empire" (marshal of France) Catherine-Dominique de Pérignon then enthusiastically proposed the construction of a triumphal arch to the glory of the emperor, a suggestion warmly backed by his colleagues, including senator Bernard Germain de Lacépède. 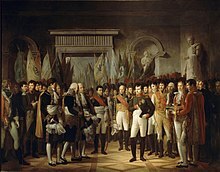 Napoléon summoned into the Senate the French princes, the Great Dignitaries and all his choicest friends, with no limit on numbers. He granted this to his brother Joseph, but also to Cambacérès, Chaptal, Fouché, Fontanes, Tronchet and generals such as Caulaincourt and Duroc. Despite being laden with Napoleon's favours, the senators nonetheless proclaimed his fall on 3 April 1814 and summoned Louis XVIII to take the throne. Louis XVIII abolished the senate. The Abbé Sieyès, president of the Sénat conservateur 1799-1801. Bernard Germain de Lacépède, president of the Sénat conservateur 1811-1813. 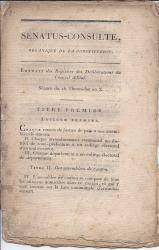 Histoire critique du Sénat Conservateur depuis sa création en nivose an VIII jusqu'à sa dissolution en avril 1814, par René Jean Durdent, 1815. 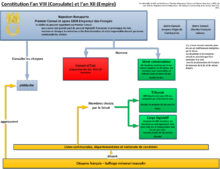 History of the Senate of France from the official website, in French. This page was last edited on 10 August 2018, at 14:50 (UTC).